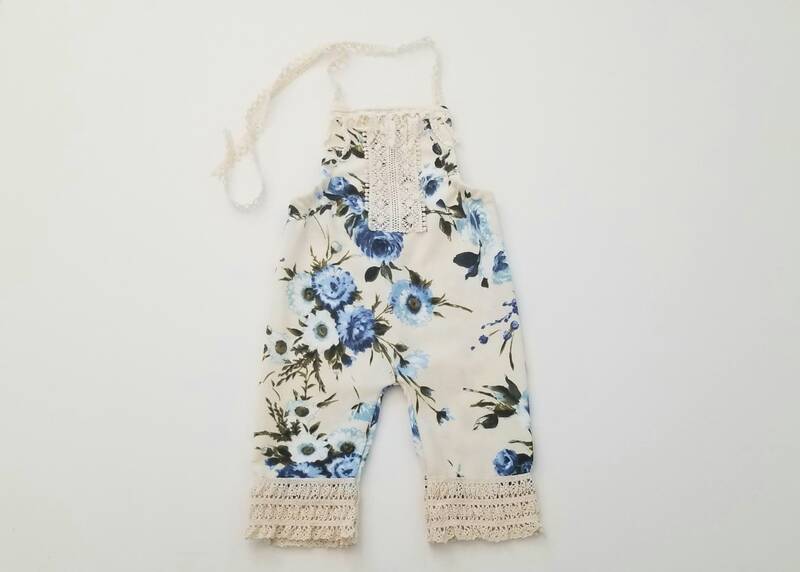 A specialty floral fabric romper with lace along the legs and in the center. The straps are made of lace crochet. The elasticity of the fabric is very high. Which is amazing when trying to accommodate multiple sizes and when little ones grow. The straps and waist are adjustable. -Looking fabulous and being safe! A halter requires being tied in the back of your baby's neck. When tying please don't knot or make the halter strap too tight. Also, it is best for babies not to sleep in halter tied baby rompers. *Please note this is a romper worn during special occasions & photoshoots. Not meant for sleeping or everyday use.